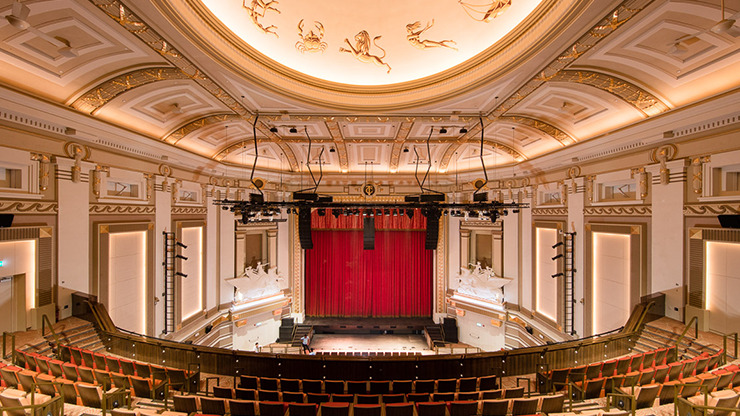 Global Face Art’s event location, the historical Capitol Theatre, is considered the epicenter of creativity. Shortly after its opening, the building, which was completed in 1929, came to dominate the Singaporean film scene as the country’s foremost movie theater. A curved, overhanging canopy in the Art Deco style and a vaulted ceiling complete with round dome both frame and define the historic building, which has meanwhile been restored without losing any of its luster of yore. Quite the opposite: the Capitol Theatre is a place where modern luxury meets the glamor of the olden days, which is why, with exactly 997 seats, it is currently the largest movie theater in South East Asia. Today, it is one of the most popular locations for exclusive red carpet events such as movie premieres, gala events and even artistic performances (e.g. theater and variety shows). Located in Singapore’s lively Civic District, the theater is easy to get to and is also part of the sophisticated lifestyle center known as Capitol Singapore, which also houses a luxury hotel, an exclusive residential complex, a garden oasis and a shopping mall.